Two roads to nurse engagement and quality outcomes. Pathway emphasizes supportive practice environments, including a established shared-governance structure that values nurses’ contributions in everyday decisions, especially those that affect their clinical practice and well-being. Creating a supportive practice environment fosters sustained excellence and inspires innovation. Nursing leaders recognize the benefit of the American Nurses Credentialing Center’s (ANCC’s) organizational credentials from the Magnet Recognition Program® (Magnet®) and Pathway to Excellence® (Pathway). Both programs provide valuable frameworks for achieving healthcare excellence that reinforce and build upon each other. Many organizations have used Pathway and Magnet frameworks to successfully improve a host of key measures, including nurse engagement, nurse retention, interprofessional collaboration, patient safety, quality, and outcomes. Both Pathway and Magnet recognition have a four-phase process: online application, document review, validation phase, and designation decision. After healthcare organizations apply and are determined to meet eligibility requirements, they submit written documentation that undergoes rigorous peer review by expert appraisers. The validation phase varies by program. If the written documentation for Magnet recognition meets the threshold for nursing excellence, a site visit is conducted to validate, verify, and amplify compliance with and enculturation of the Magnet® Model components. For Pathway, instead of a site visit, all nurses have a voice through an invitation to participate in a confidential survey during the validation phase. The final phase is a designation determination by the Commission on Magnet Recognition or Commission on Pathway to Excellence. 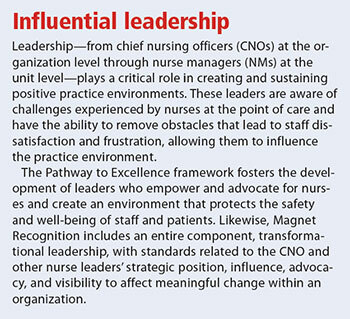 Magnet addresses the work environment through the Magnet Model component Structural Empowerment, which fosters RN involvement in shared governance, decision-making structures, and processes that establish standards of practice and address opportunities for improvement. In addition, both Magnet and Pathway nurses support organizational goals, advance the profession, and enhance professional development through their work with professional and community groups. Unique to Pathway is the well-being standard, which encourages staff to have a voice in organizational initiatives developed to promote work-life balance. Flexible scheduling and input into staff­ing, part of the well-being standard, are associated with increased job satisfaction and decreased intent to leave. Nurses are encouraged to be involved in the community, and they’re recognized for their contributions to improving population health. Practice environments that foster praise and recognition, another important Pathway component, positively impact nurses’ satisfaction and organizational commitment. In addition, Pathway organizations promote a culture of lifelong learning to ensure the professional competency and growth of all nurses. 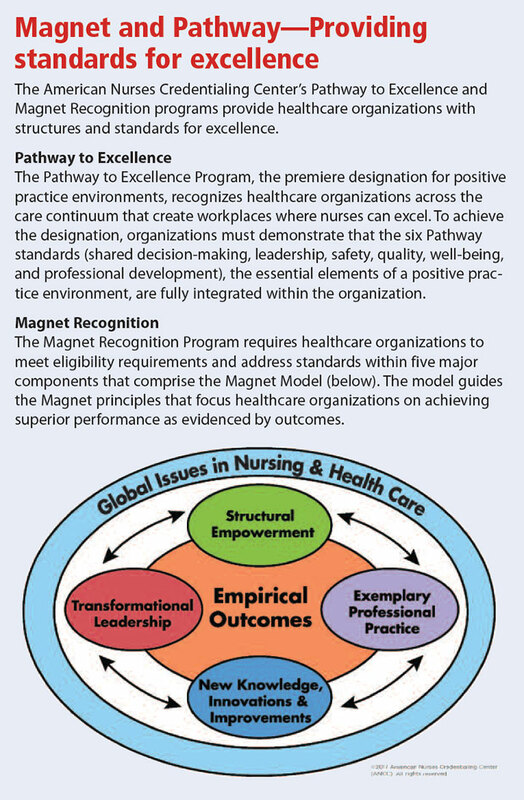 Several unique Magnet Recognition components—Empirical Outcomes, New Knowledge, Innovations and Improvements, and Exemplary Professional Practice—demonstrate nursing excellence. Empirical Outcomes, a component that differentiates Magnet from Pathway, is one way Magnet recognizes cultures of excellence and innovation. For example, Magnet-recognized organizations must demonstrate excellent patient care outcomes, including lower rates of patient falls with injury, central line–associated bloodstream infections, and stage II or higher hospital-acquired pressure injuries. Pathway to Excellence emphasizes supportive practice environments that promote engaged and empowered staff. Pathway evaluates nurses’ participation and involvement and considers how this has resulted in improved outcomes. Magnet organizations build on positive practice environments that support exemplary professional practice. The care-delivery system is integrated within this model and promotes continuous, consistent, efficient, and accountable delivery of nursing care. In addition, nurses in Pathway and Magnet-recognized organizations learn about evidence-based practice and research. Nurses in Magnet-recognized organizations systematically evaluate and use published research and generate new knowledge through research studies. This knowledge allows them to explore the safest and best practices for their patients and practice environment. Both Pathway to Excellence and Magnet Recognition programs provide valuable frameworks for achieving healthcare excellence. Many organizations have used the Pathway and Magnet frameworks to successfully achieve improvements in nurse empowerment, engagement, satisfaction, retention, care quality, and cost savings. By embracing change and innovation, Magnet and Pathway organizations, and those that are on the journey to recognition, are strongly positioned to meet new healthcare challenges and improve the future of healthcare delivery. The authors work at the American Nurses Credentialing Center in Silver Spring, Maryland. Christine Pabico is director of the Pathway to Excellence Program. Rebecca Graystone is director of the Magnet Recognition Program. Aiken LH, Sloane DM, Clarke S, et al. Importance of work environments on hospital outcomes in nine countries. Int J Qual Health Care. 2011;23(4):357-64. American Nurses Credentialing Center. 2019 Magnet® Application Manual. Silver Spring, MD: American Nurses Credentialing Center; 2017. Barnes H, Rearden J, McHugh MD. Magnet® hospital recognition linked to lower central line-associated bloodstream infection rates. Res Nurs Health. 2016;39(2):96-104. Bekelis K, Missios S, MacKenzie TA. Association of Magnet status with hospitalization outcomes for ischemic stroke patients. J Am Heart Assoc. 2017;6(4):e3005880. Carter MR, Tourangeau AE. 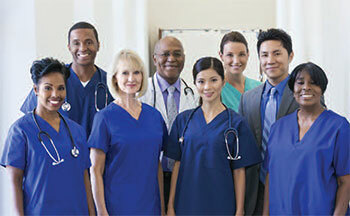 Staying in nursing: What factors determine whether nurses intend to remain employed? J Adv Nurs. 2012;68(7):1589-600. Djukic M, Kovner CT, Brewer CS, Fatehi FK, Cline DD. Work environment factors other than staffing associated with nurses’ ratings of patient care quality. Health Care Manage Rev. 2013;38(2):105-14. Evans T, Rittenhouse K, Horst M, et al. Magnet hospitals are a magnet for higher survival rates at adult trauma centers. J Trauma Acute Care Surg. 2014;77(1):89-94. Friese CR, Himes-Ferris L. Nursing practice environments and job outcomes in ambulatory oncology settings. J Nurs Adm. 2013;43(3):149-54. Friese CR, Xia R, Ghaferi A, Birkmeyer JD, Banerjee M. Hospitals in ‘Magnet’ program show better patient outcomes on mortality measures compared to non-‘Magnet’ hospitals. Health Aff. 2015;34(6):986-92. Kutney-Lee A, Germack H, Hatfield L, et al. Nurse engagement in shared governance and patient and nurse outcomes. J Nurs Adm. 2016;46(11):605-12. Lake ET. Development of the practice environment scale of the Nursing Work Index. Res Nurs Health. 2002;25(3):176-88. McHugh MD, Kelly LA, Smith HL, Wu ES, Vanak JM, Aiken LH. Lower mortality in Magnet hospitals. Med Care. 2013;51(5):382-8. Melnyk BM, Fineout-Overholt E, Gallagher-Ford L, Kaplan L. The state of evidence-based practice in US nurses: Critical implications for nurse leaders and educators. J Nurs Adm. 2012;42(9):410-7. Park SH, Gass S, Boyle DK. Comparison of reasons for nurse turn­over in Magnet® and non-Magnet hospitals. J Nurs Adm. 2016;46(5):284-90. Stimpfel AW, Rosen JE, McHugh MD. Understanding the role of the professional practice environment on quality of care in Magnet® and non-Magnet hospitals. J Nurs Adm. 2014;44(1):10-6. Staggs VS, Dunton N. Hospital and unit characteristics associated with nursing turnover include skill mix but not staffing level: An observational cross-sectional study. Int J Nurs Stud. 2012;49(9):1138-45. Tomey AM. Nursing leadership and management effects on work environments. J Nurs Manag. 2009;17(1):15-25. Wong CA, Spence Laschinger HK. The influence of frontline manager job strain on burnout, commitment and turnover intention: A cross-sectional study. Int J Nurs Stud. 2015;52(12):1824-33.